Honey, I can't see M. Night Shyamalan's talent anymore! On a lovely morning in Central Park, two young women sit on a bench. One thinks she hears a scream and notices that the strollers on the promenade have frozen in their tracks. The other woman, seemingly distracted, removes a large hairpin and stabs it through her cheek. At a nearby high-rise, some construction workers on the ground floor turn to see that one of their co-workers has fallen to his death from the roof. Two others drop from on high, then half a dozen more. It's raining suicidal men! What  is  happening? These two vignettes could be the start of such a good movie. Instead, and alas, The Happening is the latest, most dispiriting indication that writer-director M. Night Shyamalan has lost the touch that made The Sixth Sense a suspense classic and his standing as a young master of creepiness in the grand Hitchcock tradition. He's just 37, but his best films are so far behind him, it's as if he's forgotten how he made them work. In a Philadelphia high school, science teacher Elliot Moore (Mark Wahlberg) is yanked out of class to be told, along with the other teachers, about the events in New York City. No one's certain if it's a terrorist attack or a random quirk of nature, but "some kind of airborne chemical toxin" is spreading across the Northeast that's making people kill themselves. The pupils are sent home, and Elliot decides that he, his wife Alma (Zooey Deschanel) and his math-teacher buddy (John Leguizamo) will get out of town. The movie is the story of their flight. Shyamalan has some fine scenes of self-inflicted death: a YouTube video of a man walking amid the lions at a zoo, offering his arms for their next meal; the bucolic vista of a Princeton street where people have hanged themselves from trees; the sight of a family man revving up his Jeep and driving into a tree; the report of a bus in a lake. But he didn't attach these potent vignettes to a story with any narrative or emotional plausibility. The movie keeps ignoring its internal logic. If the killer is borne by the wind, why don't people in the affected area just stay inside with the windows shut and wait it out, instead of traipsing across eastern Pennsylvania farmland? For those who care less about science-fiction doomsday scenarios than the gnawing sense of dissatisfaction Shyamalan often wrings from his characters, the problems of the central couple are not exactly earth-shaking. They're childless, he's a little exasperated that she's so withdrawn, and she shared an apparently innocent dessert with a colleague who keeps pestering her with cell-phone messages. Wahlberg does all his fretting with a furrowed brow (which has not two but three vertical lines, possibly a new fashion statement for anxiety), while Deschanel bites her lip and rolls her gigantic blue eyes. Neither actor can come close to the hollow-eyed anxiety that Bruce Willis displayed in The Sixth Sense, and which anchored that movie's near superhuman grief. Eventually, Elliot and Alma form a kind of family with the math teacher's daughter, but that hasn't nearly the dramatic heft needed to fill in the cracks around the disintegrating main story. What you get is a lot of impotent anger, people walking into harm's way and the sniper-like picking off of supporting players  all the dumbest tropes of horror movies, without the robust scares a good thrill-fest delivers. It's a sorry enough spectacle to make admirers of The Sixth Sense wonder if they didn't overrate that movie, and the director's whole oeuvre? Is Shyamalan a sham? The Sixth Sense (1999) was a triumph of O. Henry-suspense and also an essay on the solitude of grief. Unbreakable (2000), a comic-book superhero battle told at an art-film tempo, was nearly as good and had another terrific, weighed-down performance by Willis. Signs (2002) was a letdown on the alien-invasion front, but it had Mel Gibson playing his own form of domestic desolation. The Village (2004), a sort of Amish retelling of Shirley Jackson's The Lottery, was the first of his films to test  and break  the viewer's patience. And The Lady in the Water (2006), in which another alien creature emerges  this one a water sprite in the swimming pool of an apartment building  fell into the preposterous mess category. Some critics, like me, gave Shyamalan a lot of rope because of the skill he showed in his first big films: a masterly camera style in which he was utterly in control of exactly how much visual information should be revealed  or concealed. He was just a natural-born suspense filmmaker of the old school. And in the age of movie facetiousness, his dead-serious take on middle-age morosity was a striking theme for a kid still in his 20s (when he made The Sixth Sense and Unbreakable). A monumentally self-assured filmmaker, and a superb pitchman for his own projects, Shyamalan used his Sixth Sense clout to maintain his independence. Aside from making his elaborate movies at home, he'd play power games with the movie brass, allowing an executive just one afternoon to read his new script before returning it to him. That sort of bravado works only as long as the product sells. But when The Lady in the Water belly-flopped with $42 million domestic, Hollywood could finally say no to the wunderkind. 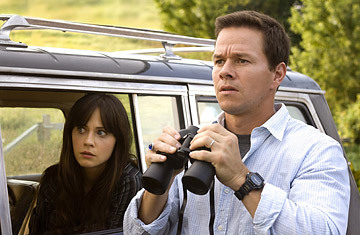 The Happening is distributed by 20th Century Fox, but the list of seven or eight producers and executive producers in the credits suggests that Shyamalan raised the money for this one himself, and that he's no longer the independent golden boy  just another indie-film director scrambling for backers. And now we have this ill wind, this feeble gust of an environmental horror story. The writer-director's disintegration from robust artistic health to narrative incoherence, from hitmaker to box-office loser, has an almost tragic trajectory. It's a saga worthy of being told by the young M. Night Shyamalan. Perhaps, with his next film, he'll have a surprise twist of cinematic brilliance that will explain and atone for the creepy stuff that's been happening to him.